Here is a simple Sight Word Reading Game that we played the other day. As learning sight words is all about repetition and exposure, we try to encourage the reading and writing of the words as often as possible. By turning the reading of the words into a game, you will find children suddenly want to play! It was more challenging to get a little ball of playdough to land exactly (and stay) on your chosen word than we'd first thought so each accomplishment was celebrated. Maddie (aged 4) enjoyed looking over the poster each time to choose a new word. Talk with them about the characteristics of the word. You could ask questions like, What letter does it start with?, What sound does that letter make?, Can you see any smaller words in the chosen word? (ie. "at" in "that") etc. After much trialling, it was discovered that a smaller underarm toss while kneeling was the easiest way for her to get the playdough balls onto (and to stay on!) the required words. There was a lot of gross motor, movement, coordination and concentration that took place. There are lots of chances to practice and revisit words while you are playing by having the child read over the words they've already managed to land balls on and discuss the words that are left. Will certain words be trickier to land on than others? Why? Adding to the game herself, she got the cards that I'd written the words onto and started matching them to the words on the poster. - Simplify this activity by starting it with fewer and easier sight words. Start with a few basics like, "the" and "and" or some simple 2 letter words that can be sounded-out, like "to," "me," "on," etc. You can even go back to single letters if that's what your child is working on. Using real balls instead of playdough. This will make it very challenging to have the ball stop exactly on the word but can work if the balls are rolled instead of thrown. - Mix it up by using the same game to help recognise and read letters, numbers, colours, shapes and so on. - Make it a multi-player game by working in pairs or small groups. Divide the words amongst the players and use a different coloured playdough per player. Taking it in turns to choose and throw, who will be the first to land a playdough ball on all of their words? - More activities that help us learn sight words. You seriously make learning to read so much fun. I have no idea how Miss Possum learnt to read so quickly with out these awesome tricks ( a natural born reader I think). The twins will need these sorts of games to stay focused. Just love it Debs! This is so creative & fun. A very clever way for little ones to learn. My son isn't at this stage yet but I am definitely pinning it to do in the future. 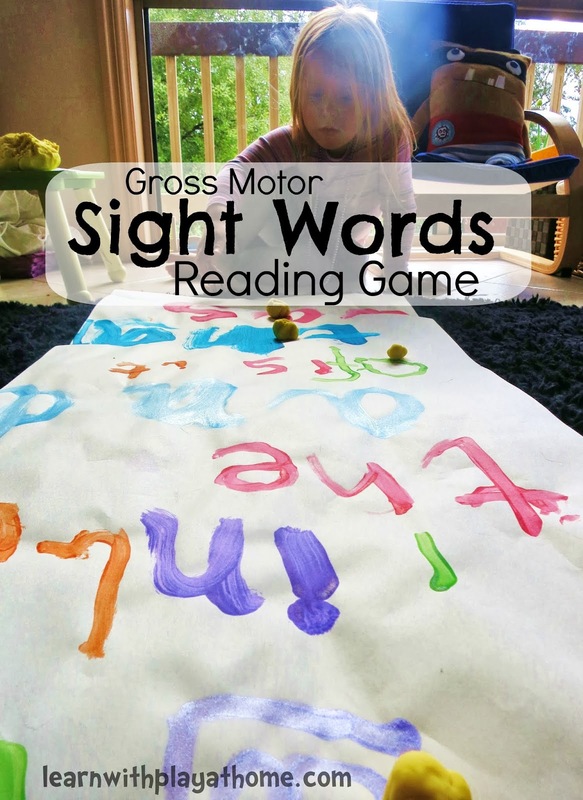 That is a clever game for learning sight words. It looks like a lot of fun. I struggle with sight words...I just don't enjoy doing them (but I know they are important). But making it a bit more fun might work. This is great! I can see it working on our driveway too with chalk. I'd love for you to share this on our After School Linky Party. We're featuring Sight Words this week. http://theeducatorsspinonit.blogspot.com/2013/09/sight-word-word-family-activities-after.html I've pinned your post onto my Sight Word Pinterest Board too. I love the incorporation of movement into this. I am a kinaesthetic learner and I feel as though my eldest (2.5) is too. When the time comes, this is just what she will need to not only stay focused and interested but also to actually retain the information. Very creative, thank you! Every one of your ideas is great, Debs - love this one too! Thanks so much for linking up at After School. What a great idea! :) I think even my pre-reader would enjoy doing this. She's good at recognising letters on their own... we might start with that and work our way to simple sight words! Such a great way to get children engaged in literacy and so simply done in the home. Love this and Maddy is a star! We a team of developers Action Group Ltd. We created a new and unique - game with words "Say Another Way" - A FUN WORKOUT FOR YOUR BRAIN. Is it you hear about Response To Intervention Software program started by Texas Education Solution for children who are suffering from Dyslexia ( it is an problem in some children by which they feel difficulty with learning to read fluently and with accurate comprehension despite normal intelligence).It helps a lot for children who are not good in study....Thanks for sharing this learning idea Superb!